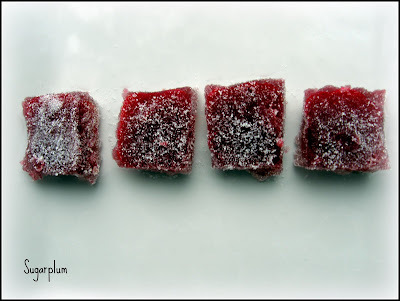 Blackberry chewy jelly candies coated in sugar. Sprinkle gelatin over water in a 2-quart heavy saucepan and let stand 4 minutes to soften. Heat gelatin over medium-low heat, stirring, until dissolved. Stir in 2 cups sugar until dissolved, then stir in lemon juice. Bring to a boil over medium-high heat, washing any sugar crystals down side of pan with a pastry brush dipped in cold water. Reduce heat to medium-low and boil, uncovered, without stirring, 13 minutes (watch carefully so that mixture does not boil over). Remove from heat and let stand 5 minutes for bubbles to dissipate. (Skim any foam that remains after 5 minutes.) Stir in fruit purée (do not scrape bottom of pan; leave any dark bits that stick). Pour into baking pan and let stand at room temperature until set, at least 12 hours. Run a sharp knife around edge of gelatin and invert onto a cutting board. Cut into 1/2-inch-wide strips, then cut strips into 1-inch pieces. Just before serving, gently toss gelées in a bowl of sugar to coat, brushing off excess. 37 comments on "Blood Orange & Blackberry Gelées"
I'm so happy you discovered blood oranges. Aren't they fabulous? I wish you could come to our farmers' market and taste them. They are sweet-tart and taste like cherries. I love this recipe too, thanks. I can't see the pictures! I'll have to check back, because I'm sure they are beautiful! I have only tried a blood orange a few times, but it's been awhile. I have never tried a blood orange either. I always see them at the store and somehow I never felt compelled to buy one. The gelees look great, too bad they didn't measure up to the taste test. I hate it when that happens! Those are gorge. I love blood oranges! I made a creme brulee with the juice and zest once and it was lervely. I've never had a blood orange either but they sound intriguing. Leave it to you to find something exciting to make with them. The candies look pretty for sure. I don't think I have ever tried a blood orange. I know that I have seen them. I will have to remember to pick some up the next time I see them. The gelées do look good. They look tasty! Never had blood oranges myself. Nice pics! YOU are an artiste!!! Couldn't Rachel use up all her oranges and just make orange gelées? And couldn't you just make those jiggly Jello things and coat them in sugar? These are just beautiful. I bet they taste as good as they look! How intensely delicious! I always get in the mood for oranges at this dark time of year, and yes...indeed, you've found a way to make them much better. ;-) Plus, like you I love ANYTHING french!! They *do* look pretty, though. SHame to loose the taste of the fruit in the sugar; I like my fruity things to taste of their source (other than, say, pig/cow gelatin). Hope you saved some oranges to eat them on their own! I'm sorry to hear you didn't like them much, Emiline... They look great! They sure are purty. I love blood oranges! This is the second post I have seen this AM talking about them! Enjoy! And I love the karma at teh grocery store! You go girl! They look like pretty little gems! I do have to agree with you though, I've had gelees before and they really are sweet. Way to go on getting a good deal on those oranges! That's a store you gotta go back to again! hahaha. I love blood oranges! I bet they would be better in orange only candy or something else. Or blood orange cocktails. Susan- Yes, I liked them. They had a tart and more complex flavor than navel oranges. Deborah- I uploaded them again. This keeps happening to me! I think it happens every time I post. Annie- I hope you feel more compelled next time at the grocery store...they're so pretty. Heather- Creme brulee sounds great. I must try that. Anj- I guess a lot of people haven't tried them! Jenny- Thanks. I took the pictures really fast, but they still turned out fast. Sue- That's seriously what it tasted like. Jello. I need to experiment around more with pectin. Cakespy- I do! I LOVE anything French. Dhanggit- That's a new picture! Is that you? Annemarie- Yes, I think I just like the fruit. I can see why people become vegetarians and vegans. That smell almost did it for me. Jenn- Yes. I do believe in karma. Val- Oh, don't worry. They'll overcharge me again. These look terrific. And great justice getting the oranges at only 60 cents. Karma at work. The caterer I work for at times makes lots of gelees and they are the first to go when desserts are passed. Oh those are so pretty! I'm surprised they are so sweet because the blackberries and blood oranges shouldn't be. What a bummer. I've never had blood oranges either. I wish that I could get blood oranges here! The gelee's look beautiful! Too bad that you didn't like them, but then, you would have never known if you didn't try them. Tremendous! I want these, NOW! What a great recipe for blood oranges...and the photos are fab...seriously, you need a Emiline coffee table book right now! Well I'm back, finally! I read through a lot of your posts and I gotta say - I'm loving the potato chip bars. YUM YUM!! What's better than sweet and salty? The ying to the yang. DE-LISH! Oooh these looks amazing! I'm so going to test out this recipe. I have the same curiosity about blood oranges but haven't had the opportunity to check 'em out yet. HI, found your blog on tastespotting. Thank you for posting this I just love these candies and now I will try them at home. Yikes a little scared but I will try them. Glamah16- Justice was served. They didn't ask me how much they were. I would have told them the truth. Mary- I think it was the sugar on the outside. Cynthia- I can't believe you've never had a blood orange, either. April- I'll send you some!! Catherine- I try very hard with my camera. It's difficult, and most of the time I don't get very good pictures. Mallow- I think pectin would definitely be an improvement. Laura- I'm warning you...They look pretty, and that's about it. Pickups- Hi, glad you stopped by. Usually my recipes are more tasty than this. I don't think I'd bother making them. Just so you know. I've always wanted to make gelées! I really need to make a baking list. The deep color yours has is very beautiful. The gelees are pretty! Nice photos. I'm glad you described them. I've seen recipes for them before and wondered how they tasted. I don't think they'd be my thing. Kelly- Then you are quite familiar with them, aren't you. They taste like how you describe. Christina- Baking list is a good idea. Mrs. Presley- Oh, well. I'm picky. Tracy- Thanks! They're not my thing, either. Kristen- The fruit was yum. I see that some other people have made something very similar to these. INTERESTING. Emiline, these jellies (um, I mean gelees) look fabulous. Haven't tried making my own (yet). 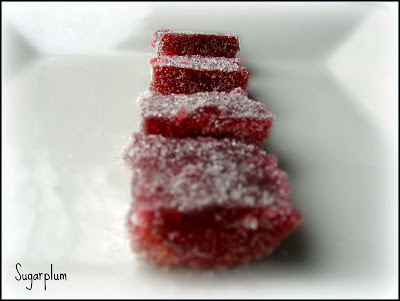 These look soooo good - I adore fruit jellies. I have never had a blood orange before, but will look out for them now.